A stuffed pork loin is a wonderful addition to a dinner party or Sunday night meal with the family. 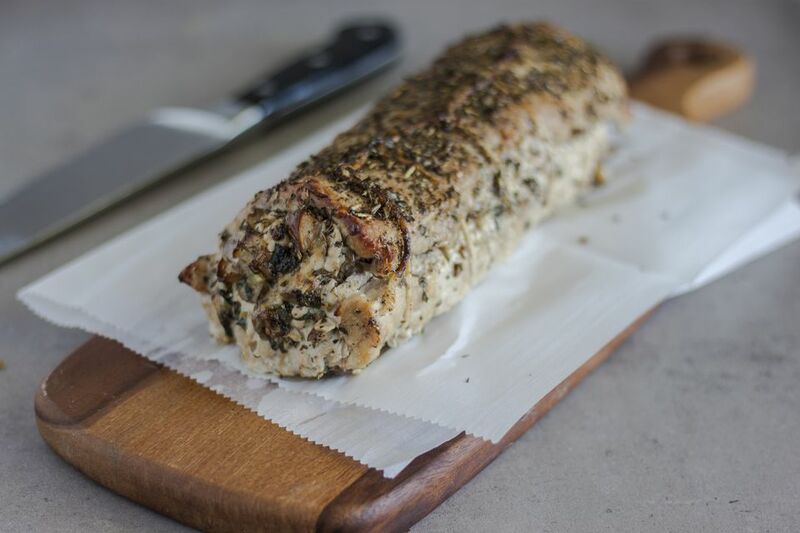 But if you don't have experience stuffing a pork loin, the task may seem daunting. Not to worry! Below, we have broken down the process in 15 simple steps. 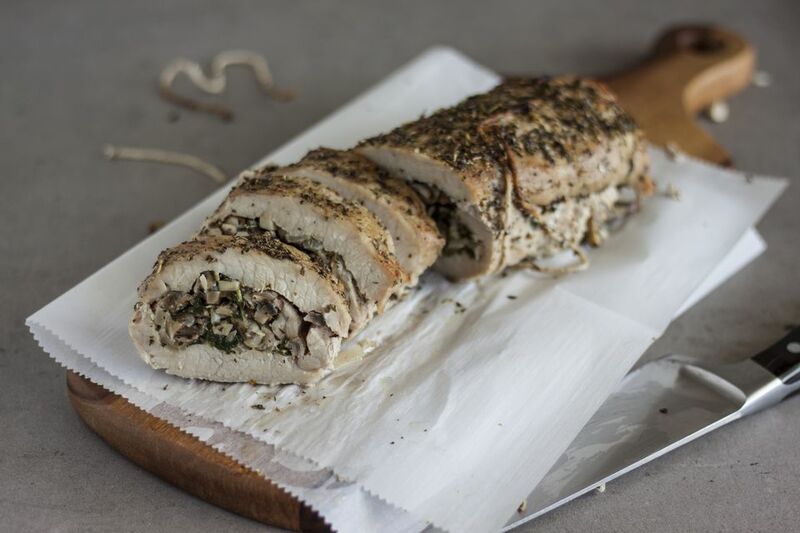 The first thing you will need to know is that in order to stuff a pork tenderloin you need to spread it open like a book, or create a whole in the middle of it, and place the stuffing in it. The easiest approach is to butterfly it and pound it out until it is about an inch thick across, stuff it, and then roll it. Follow along and we'll show you how! Make the stuffing first. It is much easier to have it already prepared than to interrupt the process of handling the pork loin in order to make it. Feel free to prepare your favorite stuffing or consider these other ideas - dairy-free stuffing, gluten-free stuffing, or quinoa stuffing. Chop the mushrooms, the parsley, and the shallots in small pieces and mince the garlic. In a large pan over medium heat heat a tablespoon of cooking oil and add all the ingredients except the Parmesan cheese. Season with a pinch of salt and a pinch of pepper. Stir the ingredients around and cook just until the mushrooms begin to soften. Remove from the heat, add the Parmesan, and gently stir it in. Depending on the specific piece of pork loin it may have a moderate or significant amount of fat tissue. Begin by trimming it by making small cuts just under parts of the fat, gently lifting them up and using your boning knife to separate them from the meat. Leaving small areas of fat is perfectly fine. This step may or may not be necessary, it depends on the cut of pork loin in front of you. If your pork loin happens to be particularly elongated on one side as seen in the picture (or both sides), choose a suitable spot to cut off the 'tail' end(s) in order to obtain a more uniform piece. Save and freeze the small unneeded piece(s) along with the trimmed fat to use later for ground pork or homemade pork sausages. The easiest method to transform the pork loin into a uniformly thick, rectangular shape is to butterfly it. While pressing onto the meat with one hand, use your boning knife to carve (make a gentle cut) from top to bottom towards the center of the loin. Open up the separated top part and continue making careful incisions along the length until you get close to the opposite end of the loin. Stop making incisions at least an inch away from the other side. Spread out the loin. Only if needed - for example one side ended up noticeably thicker than the other - carefully butterfly again on that side only, repeating the above steps. If the loin was not too thick to begin with you will only need to butterfly once. The completely butterflied loin should have more or less the same thickness. Cover the butterflied loin with plastic wrap and use a meat tenderizer to flatten it out. Be careful not to pound too hard over any thinner areas. Aim for about 1 inch uniform thickness. When done, remove the plastic wrap. Cover the entire area of the pork loin with stuffing. Carefully roll the pork loin. To secure the stuffing, measure out a string of butcher's twine about three times the length of the rolled up pork loin. Make a loop and tie a knot on one end of the loin, loop the twine underneath the loin by gently lifting it and thread the twine under itself a few inches away from the knot. Tighten the twine (not too much or you will squeeze out the stuffing) and proceed in the same manner until you reach the opposite end of the loin and tie another knot to secure it completely. Cook the stuffed loin on the grill or transfer it to a roasting pan (be sure to line it with tin foil to easily clean up the drippings) and cook it in the oven at 350 F until the internal temperature reaches 155 F. This can take anywhere from 40 mins to over an hour, depending on your oven and the size and thickness of the pork loin. Pork loin is very lean so to prevent it from drying out brush it with a mixture of olive oil and dried Italian herbs or wrap it in bacon. If you prefer, tent it with tin foil during the initial 20 minutes in the oven, then discard the foil and continue cooking until done. You may also broil it for a couple of minutes at the very end before pulling it out of the oven. Broiling will create an appetizing outside crust. Once out of the oven, let the stuffed pork loin rest for at least 5 minutes. After the pork loin has rested carefully cut and remove the twine that secured it first. Carve and serve with your choice of sides.